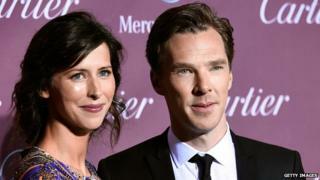 Actor Benedict Cumberbatch and his wife Sophie Hunter have become parents to a baby boy. A spokesman for the couple, who married earlier this year, said they were "delighted to announce the arrival of their beautiful son". It comes after Cumberbatch, 38, was named a CBE in the Queen's Birthday Honours List for services to the performing arts and charity. He was among recipients to be leaked ahead of the official announcement. The Sherlock star and his theatre director wife met when they appeared together in the 2009 film Burlesque Fairytales. They have kept their relationship away from the glare of the media and were rarely seen photographed together before their engagement, which was announced with a notice in the Times newspaper. The couple married in a private ceremony with family and close friends on the Isle of Wight on Valentine's Day this year. The spokesman added: "We would kindly ask everyone to respect the family's privacy during these next few precious weeks."